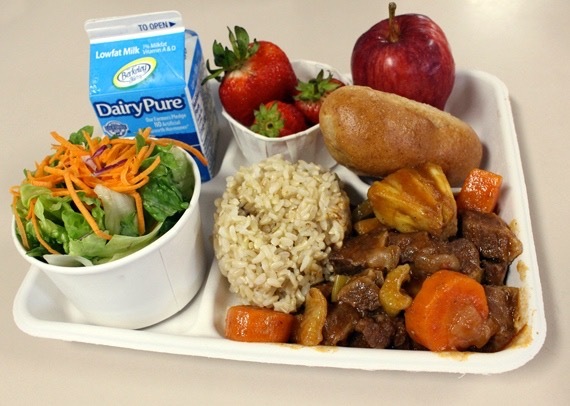 This October, participating Hawaiʻi public schools statewide will be serving ‘Ulu Beef Stew. For more information, click here. Heat oil in a large pot. Add the stew meat. Cook until the beef is browned on all sides. Add crushed tomato, tomato paste, garlic, beef base, black pepper, sugar and water (optional: worcestershire sauce and tabasco). Cover and cook, skimming from time to time, until the beef is half-cooked. Add onions and celery. Cover and continue to cook until the beef is tender. Add carrots and simmer, covered, for 15 minutes. Add ʻulu and simmer until vegetables are tender. In a separate bowl, mix flour and 1 cup of water, to make a slurry, then strain mixture through a sieve to remove lumps. Add the slurry to stew and stir constantly until desired thickness is reached. Bring back to a simmer before turning off heat.